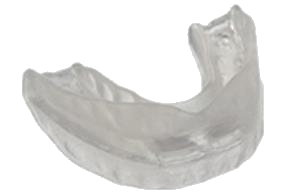 Snoring mouthpieces, also referred to as "snore guards," "snoring mouth guards," "anti-snoring mouthpieces," "anti-snoring devices," "stop snoring mouthpieces" and other similar names, are devices which are designed to stop snoring by advancing the lower jaw. Snoring mouthpieces are a drug free treatment for snoring! 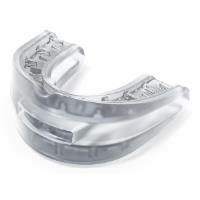 Mandibular Advancement Devices (MADs) - MADs work by advancing the lower jaw to stop snoring using your teeth. 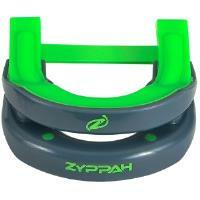 They look similar to mouth guards but are designed for jaw advancement, not dental protection. Tongue Stabilization Devices (TSDs) - TSDs work by pulling your tongue forward, instead of touching your teeth, to stop snoring. This is usually the best choice for those with sensitive teeth and dentures. See this article comparing MADs and TSDs if you are unsure which is best for your snoring situation. Snoring is an interesting problem because it is one which effects you while you are asleep and can easily go unnoticed. Snoring usually occurs in the deepest stages of sleep, the only way you could know if you snore is if someone told you or you recorded it. If you want to clearly see how much you snore and when, the best thing to do is to sleep in a quite room alone and use a snoring app. We have reviewed various snoring apps which exist on the market today so that you can track your progress with snoring. What is Snoring Mouthpiece Review? Snoring Mouthpiece Review (snoringmouthpiecereview.com) is a website which is dedicated reviewing snoring mouthpiece products. We want to help you find the best anti-snoring device through unbiased reviews of the top products available today. If you snore and are looking to find accurate information on how mouthpieces can stop your snoring, you have come to the right place! Snoring Mouthpiece Review has a unique way of reviewing anti-snoring mouthpieces, we use both scientific data and patient experience to form our reviews. All reviews are created from independent research which we conduct. Effectiveness - how well does it stop snoring? We use snoring apps to measure patient snoring, before and after using each mouthpiece. This shows how a mouthpiece actually performs and what direct difference it makes in terms of snoring intensity and frequency. We use medical grade oxygen saturation devices to record patients while the wear each mouthpiece. 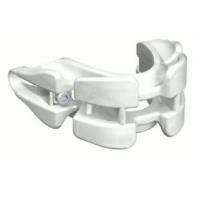 This ensures that a patient can breathe properly while wearing the mouthpiece. Fitting Process - how easy is it to fit the mouthpiece? We judge the complexity of a mouthpiece's fitting process. Some mouthpieces are easy to use while others require complicated steps. This factors into the overall equation of the device. Easy to Clean - how easy is it to keep the mouthpiece clean? Some mouthpieces require special cleaning solutions while others can be cleaned using household items. This is why we factor cleaning into ratings. Comfort - how comfortable is the mouthpiece to wear? The overall comfort of a mouthpiece is critical to its use. If a patient finds a mouthpiece too uncomfortable, it may not be worn as often or at all. The comfort rating combines both the initial experience and the adjustment period that is needed with some mouthpieces. Value - how does the price factor into the results? We factor in value, as it relates to cost, for each mouthpiece. Some mouthpieces may be twice or more the cost of another and the overall value related to it must be considered when making a purchase decision. It should be noted that Snoring Mouthpiece Review is not providing medical advice, what we are showing you are results from real patients who snore that have given us permission to share their results. From this information you can make an informed buying decision immediately. Snoring is caused by vibration of tissue in your airway while you sleep. The airway can more easily be obstructed when someone is overweight, ate a large meal or consumed alcohol prior to sleeping. We have detailed many possible causes of snoring, factors which could make it harder to breathe at night. How do snoring mouthpieces stop snoring? Jaw advancement. By holding the jaw forward, or in place, your tongue is prevented from falling back over your airway. 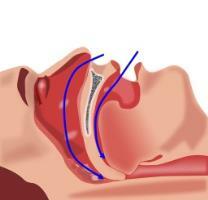 Airway blockage causes snoring. Mouthpieces vary in how far they advance the jaw, from 0 mm to 16.0 mm. Most successful treatment shows an advancement of 6.5 mm +/- 2.3 mm (source). What studies prove snoring mouthpieces are effective? There were 89 distinct publications between 1982 and 2006 which dealt with oral appliances on sleep breathing, consisting of 3,027 patients. These sleep studies were performed on patients with and without a mouthpiece (source). 70% of snorers and 70% of bed partners reported improvement in snoring using a mouthpiece. Patients had a 54% reduction in apnea events with a mouthpiece, meaning they could breathe much better. Patients felt 69% less sleepy when they wore a mouthpiece for snoring. The conclusion was that mouthpieces "...have a definitive role in the treatment of snoring and sleep apnea." How quickly does a snoring mouthpiece work? For most people, they will see results the first night. For those that have some discomfort or getting used to the mouthpiece, it can take a few more days. Can I wear a snoring mouthpiece with dentures? If you have dentures, your best choice is to buy a Tongue Stabilization Device (TSD). These devices pull your tongue forward while you sleep instead of attaching to your teeth. One example of a TSD is Good Morning Snore Solution. When you snore, you are preventing your body from getting oxygen and this impacts your health. Lack of sleep presents both short and long term damage to your body. It is much healthier to not snore! What do doctors think of snoring mouthpieces? What health organizations recommend snoring mouthpieces? Both the American Academy of Sleep Medicine and the American Academy of Dental Sleep Medicine recommend using a snoring mouthpiece as treatment for snoring. Almost all of the snoring mouthpieces on the market have been tested for safety. In the United States, most have been tested by the FDA (United States Food and Drug Administration). They test to confirm the materials in the product are safe and also that the device can be effective. Can you just use a sports mouth guard instead of a snoring mouthpiece? No. 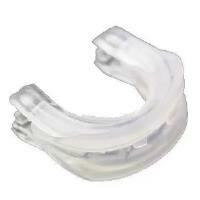 It is a common misconception that someone can use a mouth guard for sports to stop snoring. 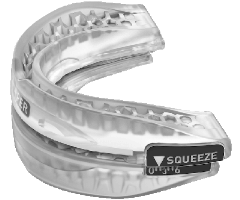 Mouth guards for sports do not adjust the position of the jaw, they just protect the teeth and prevent concussions from jaw trauma. 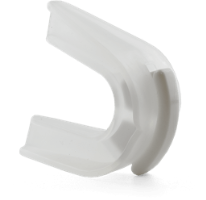 Anti-snoring mouthpieces advance the position of the lower jaw where sports mouth guards protect the teeth. Can snoring put a strain on relationships? Can you wear a snoring mouthpiece if you grind your teeth? Most of the snoring mouthpieces that rest on your teeth will work to prevent teeth grinding as well. The tongue devices do not provide this support however. Snoring mouthpieces, MADs especially, are generally not recommended for people with temporomandibular joint disorder (TMJ). What is the best snoring mouthpiece? The best snoring mouthpiece for you will depend on how healthy your teeth are and how your specific anatomy plays into your snoring. If you have healthy teeth, try a MAD, the ones that rest on your teeth. If you dentures or unhealthy teeth, you should try a TSD, the ones that pull your tongue forward. Generally, the best mouthpiece is going to be the one that is the most customized to you. For this reason, mouthpieces that offer you the ability to form an impression of your teeth are usually the best. Should I use a jaw or tongue mouthpiece? The decision of which mouthpiece you use, a MAD or a TSD, will be based on your dental health and comfort. A MAD is not necessarily better than a TSD but it does have higher rates of continued usage. A TSD is generally for those who have dentures, missing teeth or jaw pain while a MAD is for those with healthy teeth. In both cases, the tongue is advanced forward to open the airway. It may be worth trying a MAD and then a TSD so that you can find which is the most effective and comfortable for you. This will lead to the longest term benefit in reducing your snoring. What if a snoring mouthpiece doesn't work for me? Almost all of the makers of snoring mouthpieces offer a type of refund or return if the mouthpiece doesn't work for you. 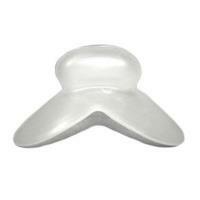 Generally, reports indicate over 80% of people who wear a snoring mouthpiece reduce or stop their snoring completely. Therefore, it makes sense to try a snoring mouthpiece. 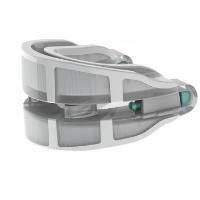 What if I have sleep apnea, will a snoring mouthpiece work for me? It's not recommended for someone with severe or central sleep apnea to use a mouthpiece instead of a CPAP machine. 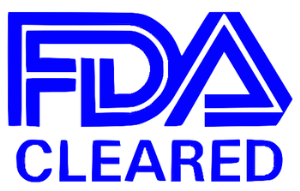 There are varying degrees of sleep apnea, some snoring mouthpieces are actually FDA cleared for treatment of mild top moderate sleep apnea. It is your responsibility to know if you have severe or central sleep apnea. Almost all of the mouthpiece vendors require you to fill out a form that identifies your health situation. You can see a comparison of CPAP vs. mouthpieces here. What makes one snoring mouthpiece better than another? Generally, the more customized the mouthpiece is to your bite, jaw and dental issues, the better. For this reason, mouthpieces that get you to make an impression of your teeth are usually the best. The overall comfort of a mouthpiece is also important. If the mouthpiece is too uncomfortable to wear, or takes too long to get used to wearing, it is not as likely to be worn. The more a mouthpiece advances your jaw, usually the more effective but each person is different and must find their own unique setting. If you have dentures or other dental issues, the best snoring mouthpiece for you will probably be a device that works with your tongue instead of your teeth. What is a boil and bite mouthpiece? When referring to the fitting process of some snoring mouthpieces, often you will hear "boil and bite" used. This is a process of first boiling water and then placing the mouthpiece into the boiling water to make it soft and impressionable. Once the mouthpiece is in this state, you can bite into it to leave a custom impression of your teeth. 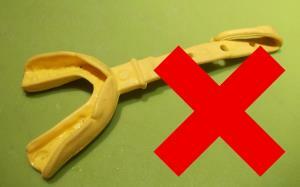 This is important to keep the mouthpiece from falling out of your mouth and making sure its comfortable. Not all mouthpieces are boiled at the same temperature or for the same amount of time. It is important to follow the directions on each individual mouthpiece to get the most effective impression. 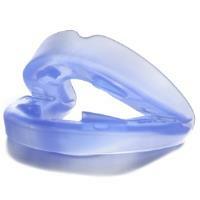 Why can't tou buy a snoring mouthpiece on Amazon, CVS, eBay or Walmart? Snoring mouthpieces are class II medical devices. This means that they must be sold from the company which makes them, or from one of their authorized sellers. You cannot buy them over the counter. When you buy a snoring mouthpiece, you must usually submit a questionnaire that indicates you are aware of your health. This is what makes it possible to buy a snoring mouthpiece without visiting a doctor. Which snoring mouthpiece should you buy? Do you have dentures, jaw pain or have you had dental implants recently? Can you make an impression of your teeth using boiling water?